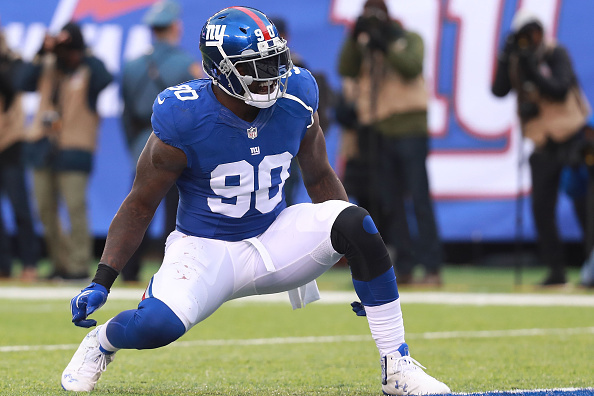 It is not a matter of if the Giants want defensive end Jason Pierre-Paul to return. It is a matter of whether they can make it happen financially, Jordan Raanan of ESPN.com reports. Pierre-Paul is set to become a free agent after completing his seventh season with the team. He had 7.0 sacks in 12 games before sports hernia surgery ruined his prove-it year. To erase doubts he could still play at a high level after losing his right index finger and parts of several others in a fireworks accident, Pierre-Paul was among the league leaders with eight batted passes and added 54 quarterback pressures, according to Pro Football Focus. It’s not going to be easy. Pierre-Paul deservedly wants to get paid with a long-term deal, but the Giants are already heavily invested in their defensive line and have Pierre-Paul and defensive tackle Johnathan Hankins as pending free agents. Word on the street is that they are genuinely trying to keep the defense intact, which means bringing back Pierre-Paul and Hankins. The Giants might need to use the franchise tag on Pierre-Paul for the second time in three years to make it happen. The franchise number for a defensive end is expected to be about $17 million. That might be where this one is headed, at least as a place-holder until a long-term deal is reached.